KONG Cat Tennis Balls are brightly-coloured tennis balls with an interior bell for cats. This makes play time even more attractive. One net of KONG Cat Tennis Balls contains three balls. Playing is healthy! It challenges your cat and keeps him active. Tennis balls are not only fun for dogs, they are also a great toy for cats. The KONG Cat Tennis Balls are fun balls for cats. Your cat can chase and catch them. The interior bell makes play time even more fun. The felt around the balls is non-abrasive, so it will not harm your cat's teeth. 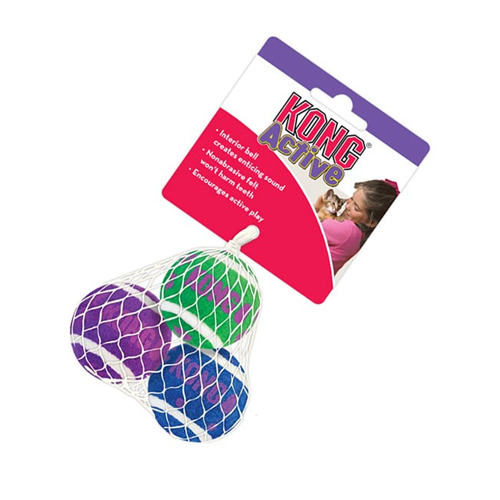 One net of KONG Cat Tennis Balls contains three tennis balls with a diameter of ca. 6 cm. Have you used KONG Cat - Tennis Balls before? Let us know what you think about this product.